Much like the original iPhone, the iPhone 3G combines mobile phone, iPod, and Internet functionality -- although the iPhone 3G most notably adds 3G (UMTS/HSDPA - 850, 1900, 2100 MHz, 3.6 Mbps) support and GPS functionality. The iPhone 3G features the same 3.5" display with 320x480 resolution at 163 ppi, but uses a slightly thicker case -- .02 of an inch -- with either a black or white plastic back -- rather than aluminum like the original model. It includes 8 GB or 16 GB of storage (white model only available with 16 GB), support for Wi-Fi (802.11b/g), Bluetooth 2.0+EDR and an intergrated 2.0 megapixel camera that supports "geotagging". Apple reports that the iPhone 3G provides "up to" 24 hours of audio playback, 10 hours of talk time on 2G, 5 hours of talk time on 3G, 5 hours of Internet use on 3G, 6 hours of Internet use on Wi-Fi, 7 hours of video playback and 300 hours of standby time. The iPhone 3G uses the same "multi-touch" interface, as well as accelerometer, ambient light, and proximity sensor capabilities as the original model, although it has two proximity sensors compared to one in the original. 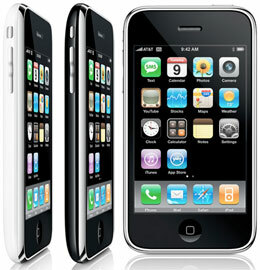 What are the differences between the original iPhone and the iPhone 3G? How does the iPhone 3G compare to the Samsung Instinct, HTC Touch Diamond, and LG Dare?